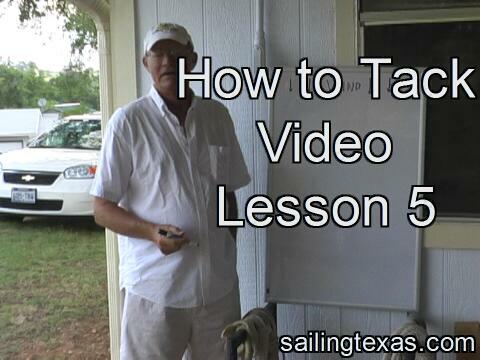 The Sailing Texas Online Sailing Class is free, supported by your contributions. Please click below to help keep it online and expanding. 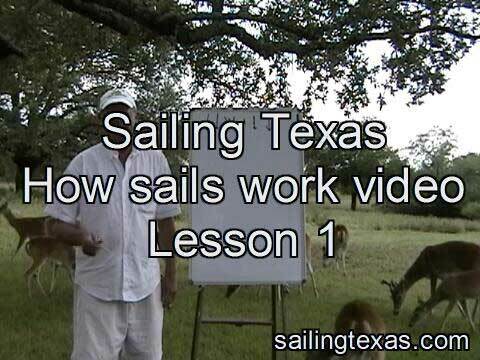 Contribute by mail Welcome to the Sailing Texas Free Online Sailing Class. This class will include David's two day "learn to sail" class, and more. There are many theories on How Sails Work, and they all have truth to them. However, they sometimes seem to contradict one another and can be confusing. 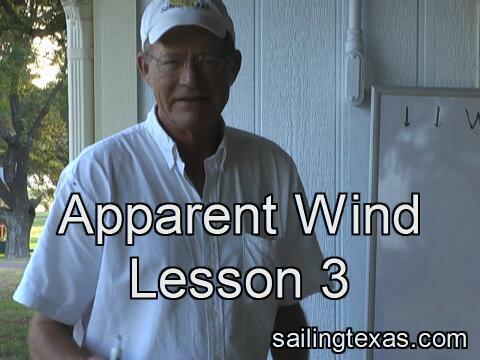 I try to keep it simple, and this first series on how sails work is what I use when teaching and racing. Sails are a simple surface, but using them well is complex, so the videos start simple and become more complex as more is included. The way I understand how sails make power from the wind is simple, and it works for me, sailing and racing. I hope this simple basic understanding will help you get more control, power, enjoyment and safety from your sails. Click image for How Sails Work, Lesson 1, 25MB file. Points of sail refer to the direction of the hull in relation to the true wind. In a beam reach the hull is perpendicular to the wind direction, and so on. 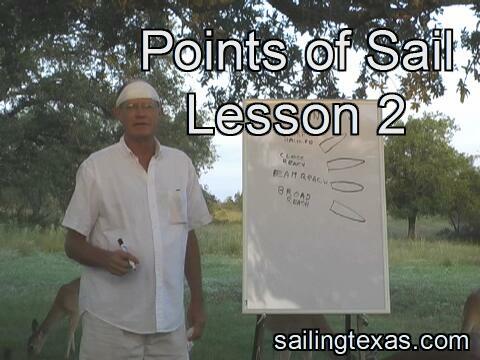 Points of sail are useful for communication among sailors, and for understanding how the different points of sail work. The video files are large and may take time to start, depending on your connection speed. You can right click on the image and Save Target to save the largest file to your hard drive so you can view at your leisure. Click image for Apparent Wind, Lesson 3. Apparent wind is the wind that comes across the boat, a sum of the true wind and the wind created by the motion of the boat. The apparent wind is what we use when sailing. It comes from a different direction than the true wind and/or at a different speed. The only time the true wind and apparent wind are the same in both speed and direction, is when the boat is not moving. How can a sailboat go against the wind is a very frequent question I'm asked. Here's the answer, not just how it's done but also why it works. 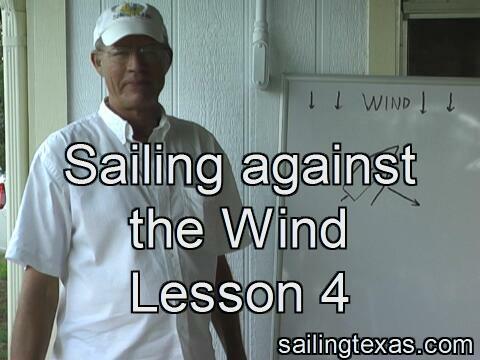 Sailing Against the wind, Lesson 4, 10MB file. Click image for Tacking, Lesson 5. Tacking is turning a saiboat into the wind until the sail changes sides and powers up again. A tack can be different every time, so doing a "good tack" means a lot. To coast through the tack head to wind when the boat has no power you must have sufficient speed and a smooth turn that doesn't slow the boat. Stopping the turn when the sail returns to full power is best. The wind may shift during your tack, so deciding how far to turn before the tack is often wrong on lakes. This Sailing Class is far from complete. I have many things to film and add, to help people learn to sail. There is more below in this table of contents, and sometimes a new part is added to a part already there. More on jibing and the clove hitch is coming, but it will be under headings already here. Guess I'll start a "what's new" column.